Castle Downs is a residential area in the northwest portion of the City of Edmonton in Alberta, Canada. It was originally established in 1971 through Edmonton City Council's adoption of the Castle Downs Outline Plan, and then extended northward in 1983 through the adoption of the Caste Downs Extension Area Structure Plan. Combined, these two plans guide the overall development of the area. Located in northwest Edmonton, the Castle Downs area is bounded by 127 Street to the west and Anthony Henday Drive (Highway 216) to the north. On the east, it is bounded by 97 Street (Highway 28) to the north of 153 Avenue and Castle Downs Road (113A Street) to the south of 153 Avenue. On the south, it is bounded by 137 Avenue to the west of Castle Downs Road and 153 Avenue to the east of Castle Downs Road. The area is also bisected by 167 Avenue and 112 Street. The Griesbach neighbourhood is located east of Castle Downs Road and south of 153 Avenue to the southeast. 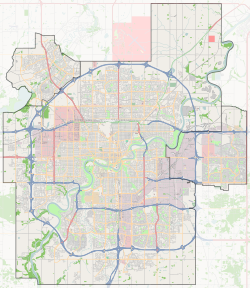 The Lake District (Edmonton North) area is located beyond 97 Street to the east, while the Kensington neighbourhood is beyond 137 Avenue to the south. The Palisades area is located across 127 Street to the west, while the future Goodridge Corners neighbourhood is beyond Anthony Henday Drive to the northwest. Sturgeon County is located beyond Goodridge Corners to the northwest and 1.2 km (0.75 mi) beyond Anthony Henday Drive to the north. the Rapperswill NSP in 2010, which applies to the Rapperswill neighbourhood. The Castle Downs Transit Centre is located on 153 Avenue and Castle Downs Road. Amenities at this transit centre include bike racks, a large shelter and a pay phone. There are no washrooms, vending machines, or park and ride available at this transit centre. The transit centre has been undergoing an overhaul as part of a citywide $37.75 million transit centre improvement project. The federal government provided $4.86 million in funding for the Castle Downs Transit Centre renewal project. While the bus way replacement portion of the project has been completed, the $3.527 million tender for the replacement of the rest of the transit centre, including the shelter, was awarded on February 6, 2018, with construction expected to be complete in March 2019. School special routes that arrive/depart from Castle Downs Transit Centre include routes: 609, 756, 832, 840, 852 and 934. ^ a b c d e f "Castle Downs Outline Plan (Office Consolidation)" (PDF). City of Edmonton. December 2006. Archived from the original (PDF) on 2012-05-12. Retrieved 2012-05-12. ^ a b c d e "Castle Downs Extension Area Structure Plan (Office Consolidation)" (PDF). City of Edmonton. September 2005. Archived from the original (PDF) on 2012-05-12. Retrieved 2012-05-12. ^ a b c d e f g h "Welcome to Edmonton Maps". City of Edmonton. Retrieved 2012-05-20. ^ "Griesbach Neighbourhood Area Structure Plan (Office Consolidation)" (PDF). City of Edmonton. August 2010. Archived from the original (PDF) on 2012-05-12. Retrieved 2012-06-26. ^ "Edmonton North Area Structure Plan (Office Consolidation)" (PDF). City of Edmonton. September 2010. Archived from the original (PDF) on 2011-06-16. Retrieved 2012-06-26. ^ "Palisades Area Structure Plan (Office Consolidation)" (PDF). City of Edmonton. September 2011. Archived from the original (PDF) on 2011-06-16. Retrieved 2012-06-26. ^ "Edmonton Developing and Planned Neighbourhoods, 2011" (PDF). City of Edmonton. Archived from the original (PDF) on 2013-09-04. Retrieved 2012-06-26. ^ "Goodridge Corners: New Neighbourhood Proposed in North West Edmonton". City of Edmonton. 2010-04-27. Archived from the original on 2010-11-22. Retrieved 2012-06-26. ^ "Castle Downs Outline Plan (Baranow Area) (Office Consolidation)" (PDF). City of Edmonton. May 2011. Archived from the original (PDF) on 2012-05-12. Retrieved 2012-05-27. ^ "Canossa NSP (Office Consolidation)" (PDF). City of Edmonton. August 2004. Archived from the original (PDF) on 2012-05-12. Retrieved 2012-05-27. ^ "Chambery Neighbourhood Structure Plan (Office Consolidation)" (PDF). City of Edmonton. May 2006. Archived from the original (PDF) on 2012-05-12. Retrieved 2012-05-27. ^ "Elsinore Neighbourhood Structure Plan (Office Consolidation)" (PDF). City of Edmonton. February 2006. Archived from the original (PDF) on 2012-05-12. Retrieved 2012-05-27. ^ "Rapperswill Neighbourhood Structure Plan (Office Consolidation)" (PDF). City of Edmonton. June 2011. Archived from the original (PDF) on 2012-05-12. Retrieved 2012-05-27. ^ "Castle Downs Transit Centre Map" (PDF). City of Edmonton. Retrieved September 28, 2017. ^ a b "Castle Downs Transit Centre". City of Edmonton. Retrieved September 25, 2017. ^ Simes, Jeremy (12 May 2017). "Edmonton to begin replacing transit centres this summer". Metro News. Archived from the original on 13 March 2018. Retrieved 16 March 2018. ^ "Federal Government Infrastructure Investments in Alberta Examples". Government of Alberta. Retrieved 16 March 2018. ^ "Opportunity Notice - City of Edmonton Tender 931913 Castle Downs Transit Centre Renewal". Government of Alberta. 7 February 2018. Retrieved 16 March 2018. ^ "Castle Downs TC Building Construction (Completion Date Jan 2019)". City of Edmonton. 2 December 2018. Retrieved 17 January 2019. ^ "Brochures in PDF". City of Edmonton. Retrieved 2 December 2018. ^ Bartko, Karen (14 November 2018). "Transit buses to detour around Groat Road bridge construction until mid-2020". Global News. Retrieved 20 November 2018. ^ "School Service: ETS Trip Planner". City of Edmonton. Retrieved September 28, 2017. This page was last edited on 17 January 2019, at 23:13 (UTC).